Peripheral structures of the calcaneus include the sustentaculum tali, the peroneal tubercle, and the medial and lateral calcaneal tubercles. 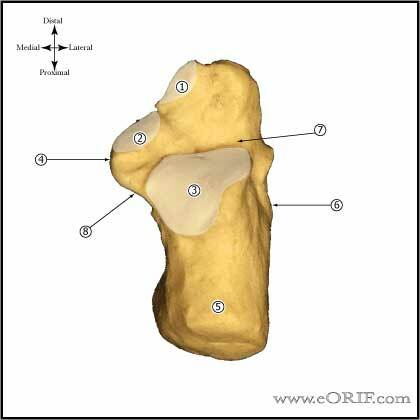 Anterior process: a saddle-shaped projection of bone at the superior aspect of the calcaneal body. Its inferior surface articulates with the cuboid. The bifurcate ligament inserts on the anterior process and connects the cuboid and navicular bones. Serves as the origin of part of the extensor digitorum brevis. Tibial nerve crossses the calcaneous below the sustentaculum tali medially and may be injured with displaced fractures causing incomplete loss of sensation on the plantar surface of the foot. Plain films are initially negative. Approximately 10 days after symptoms start x-rays reveal a line or density in the posterosuperior portion of the calcaneus perpendicular to the trabecular stress lines. MRI: best test, highly sensitive. (Sormala MJ, JBJS 2006;88A:2237). Boden BP: Low risk stress fractures. Am J Sports Med 2001;29:100-111. Leabhart JW: Stress fracture of the calcaneus. JBJS Am 1959;41:1285-1290.